Computer games are one of the favorite pastimes not only of young people. Players can have different age. Video games allow a specific journey into alternative worlds, allow you to embody another character and get to know the emotions of the presented world. Games are primarily entertainment, which is a kind of mini story, a narrative that was carried out by the game designer. It is also a form of education, broadening horizons, and sometimes also the opportunity to earn salary or rewards. This is Gamehag, a site dedicated to video game enthusiasts. 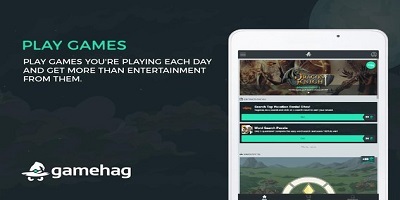 Gamehag is a service whose goal is to bring together game lovers and create a specific community of players. The website enables turning exciting games into titles that have been placed on it. The use of the website is fully free. What can you play at Gamehag? To the player is given the option of playing only in titles that have been placed on the site. The selection is wide, and the available games belong to different genres and offer various forms of rolling the game. The catalog of the proposed titles includes both strategic and economic games as well as mmorpg, action games and sports simulators. Among the available proposals you can find such hits as Fifa 18, Stronghold Kingdoms, Generals of War, Forsaken World, Tribes, The Settlers, Aion and World of Tanks, it's may change every day, so you should check site every week.. In each game we have a specific task to do. After completing it, we receive a certain number of soul stones. If we collect the appropriate amount, we can exchange it for attractive prizes. The tasks are different, depending on the game you want to play. If it's World of Tanks, for example, one of the tasks is to win several battles. So we're going to the game and we're doing this job. If we manage to do the task, then we have to do, e.g. screenshot of your profile with the number of battles won and send them through the tab on the page. What awards can you get at Gamehag? The system of collecting soul stones is a kind of loyalty program. It involves collecting the right amount of points that can be exchanged for prizes. Each of them has its price, which is expressed in the right number of soul stones. The prizes can have many different characters. Among the most attractive, one should mention the possibility of obtaining codes for playing on Steam or supplementing the Steam Wallet. They can also be a variety of themed skins or wallpapers related to the world of games. You ask: it's a blog about earning money, why was this site here? There are several reasons. Some people who want to make money via the Internet may try this method because of their young age. Maybe you are just such a person and you collect the game and maybe just on the steam. To know this is a super alternative for you. You play free games and in addition you collect money for the game you want to buy. There is also a prize in the form of paysafecard. If we are smart, we can exchange this card with no problem for a bank transfer. And those who are less clever can simply use this card in many online stores and more. Gamehag is also the focus of the player community. This is a website that is created for game enthusiasts. In addition to being able to play the game and win prizes, the service community gets the opportunity to learn about new games related to published articles, and to exchange views on the forum. Gamehag is a great alternative for the lazy ones. We do not have to do a lot to earn something. In addition, we do what most people like. We play games! And if we are not convinced of this idea, it is always worth trying because we have nothing to lose!